Anna at a November 2011 Museum of Modern Art tribute to Pedro Almodovar. Photo by Dimitrios Kambouris/Getty Images North America. 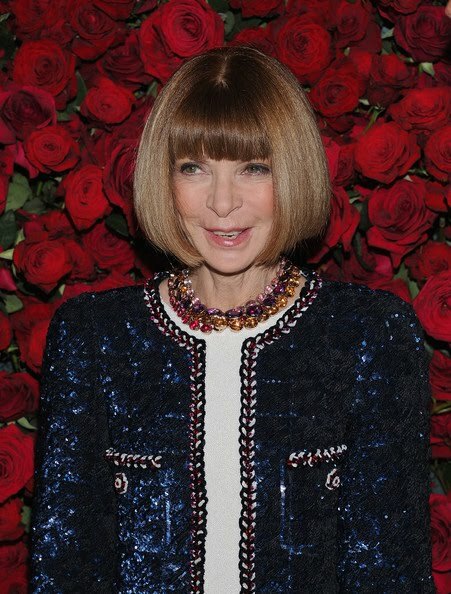 I’ve noticed that Anna Wintour, Editor in Chief of Vogue, has taken to wearing her gorgeous gemstone Georgian collet necklaces in stacks, which I just love. They are rumored to be from the renowned jeweler S.J. Phillips Ltd. in London and cost approximately $20,000 a pop. Do not even get me started on this insanely gorgeous (and sequined!) Chanel suit. That navy blue against a backdrop of red roses? I’m dying! Photo by Dimitrios Kambouris/Getty Images North America. 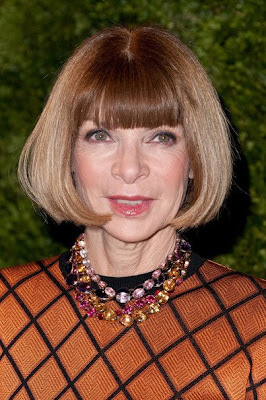 Anna in her necklaces at the CFDA/Vogue Fashion Fund Awards in November 2011. Photo by D. Dipasupil/Getty Images North America. All of this means Anna is the perfect candidate to be part of the post “How I Wear My: Statement Necklace” that my friend Adrienne of The Rich Life (on a budget) and I have planned for January 3, 2012. Why don’t you channel a little of Anna’s glamour and send Adrienne or me a photo of yourself in your statement necklace? We’d love to include your and your blog in all this elegant fun. Collet necklace by Nerida of Art for Interiors. The style if your necklace is quite similar to Anna's. Now all you need is that spectacular navy sequined suit...I'm drooling over it! I have just arrived from my daughter´s house,with a broken computer, so unplugged; and found you lovely comment. Happy Christmas, New Year, and all the best for you and your family. I will let you know how things go,we want to book soon. Fingers crossed. OH my, that sequins Chanel suit is absolutely divine! I love a great statement piece. Hope you had a Happy Christmas, and wishing you a wonderful New Year! oh yeah! I'm with you on the sequined Chanel outfit - dying too! I'll have to do a statement necklace post for you - I have to say though that all my statement necklaces are of the much cheaper costume jewelry variety than Ms Wintours!